The Grow Your Blog event is ongoing! While I didn't get to join this year, I want to encourage you to go find new blogs over at Vicki's and meet a lot of wonderful bloggers there. Many of the participants have giveaways! And it's so much fun making new friends out there in the quilting world. In honor of this annual event, I'm giving away a book about machine applique. 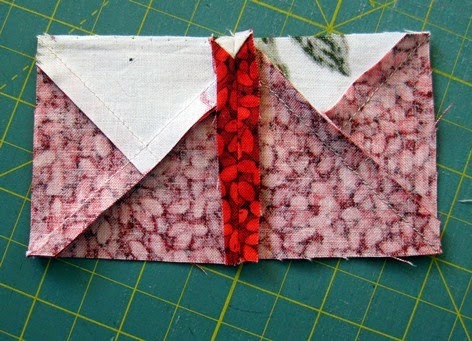 Beth shows you in detail how to machine applique. It includes 9 lovely projects plus templates. There are several ways to win this book. 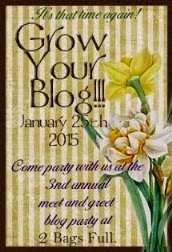 Leave a comment telling me of a new blog I should visit from the hundreds at the Grow Your Blog event for a chance. Or visit Linda here and leave a comment for her on her Ghost Quilting for another chance. Then tell me you visited and what the pin cushion is used for and have a third chance! Good luck! The giveaway will end same time as the Grow your Blog - I will ship anywhere. Now I want to tell you how I make pieced prairie points. They're for a border I'm making for one of my WIPs. 1. 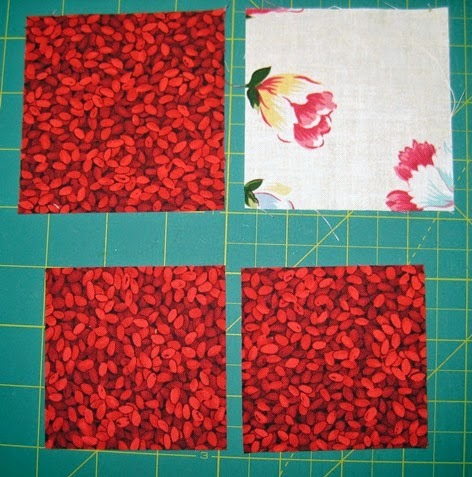 For every 4 prairie points I needed one 3 1/2" background square and one 3 1/2" (PP) prairie point fabric. I also needed two 3" squares of background fabric. You can change the dimension as needed for the size of your prairie points you want. I wanted my units to finish at 2". 2. 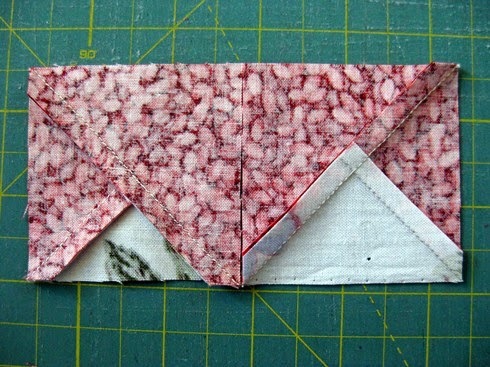 I took the two 3 1/2" squares and drew the diagonal on the back of the PP fabric. 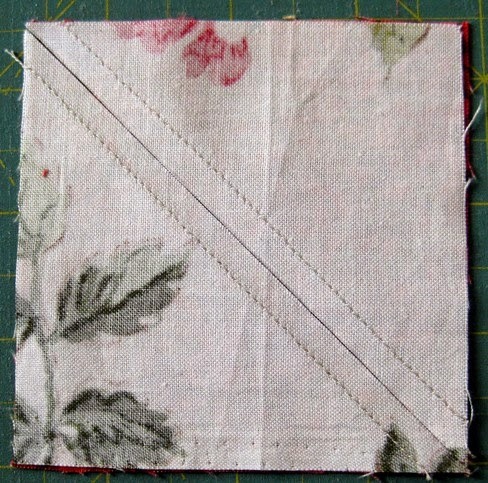 I then sewed a scant 1/4" to the right of the diagonal on both sides. I then cut it on the diagonal. 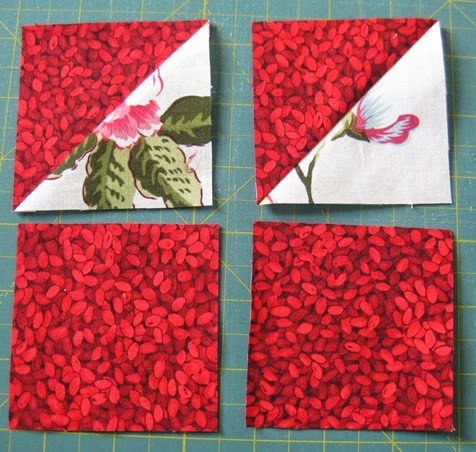 I sewed all the pairs I needed at this step to take advantage of chain piecing. 3. I then lightly pressed one seam allowance toward the PP fabric and one toward the background , then trued them up to 3" hsts. 4. 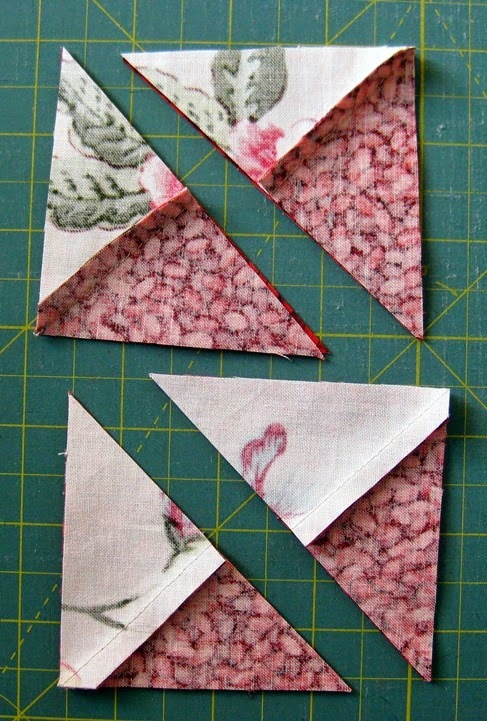 I then took my 3" background squares and paired them with the trim hsts I had made - two at a time at this point. 5. Next I placed my ruler with it's diagonal line on the left side of the block as pictured and cut the paired pieces on the diagonal formed by the edge of the ruler. I did this to both pairs. 6. Here's what they looked like. 7. 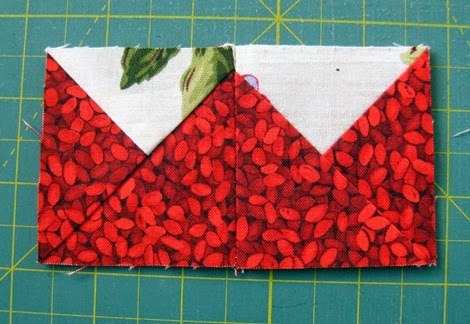 I then sewed them together using a scant 1/4" seam. I cut these in pairs from the chain piecing to keep them together. 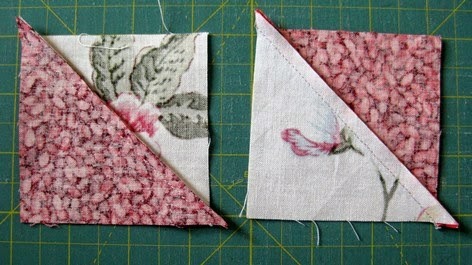 I then pressed firmly to be sure one of the short triangle seams went toward the light and one toward the dark fabric. 8. Now the units are ready for their second truing up. 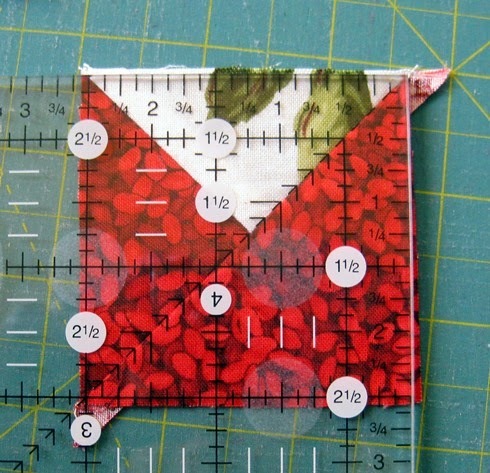 The ruler's diagonal is on the long diagonal seam, and I center the lines for a 2 1/2" square so that there is some fabric to trim from all four sides. This keeps my units from being lopsided at a side. 9. When I turned the two paired units over I check that the seams will nestle when I go to sew them together with a scant 1/4". 10. Once the seam is sewn, I press the seam open to spread the bulkiness of the seam to each side. And my two prairie point units are done, ready to be sewn to others to make my prairie point border. I'm linking to Connie's Linky Tuesday party. Hope to see you there. I visited Linda's blog. The pincushion is used for telling you which needle is currently used in your sewing machine. 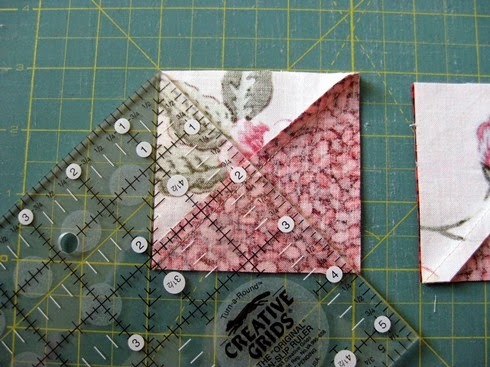 I found her blog during the Grow Your Blog event and really like her piecing with hexagons, triangles, and diamonds. You could check out Chantal's blog at http://atthecornerofscrapandquilts.blogspot.ca/ I found it during the hop and became a follower. I love the pincushion idea to keep track of the type of needle in the machine! Plus... I love your giveaway book! I even love the cover pattern.. if I win..that is what I will make. It would make a great wall hanging and that is something I want to get into! Thanks for the tutorial. I have only seen 3D ones in the past, and I like this better. Looks like a great book, too. Thanks for the chance to win. Congratulations on your own win of that great pattern! I like the idea of a pincushion for the different types of needles being used. Your prairie points are outstanding! That ghost quilting is phenomenal! I see that her pincushion is an organizer for what's in her machine, but can also hold the needles that have been partially used, a very clever idea. Nice way to make prairie points, thanks for sharing. I loved discovering https://knettycraft.wordpress.com/ from the blog hop. so much so that I am going to start a collection of pieces to make a quilt representing my blog readers. That book looks awesome, not sure I would be able to manage such beautiful appliques. great tutorial. Thank you. The pincushion has the needles being used. Thank you for sharing this detailed tutorial. Lovely Blog - I'll come back! thank you for the tutorial. Would love to win the book.